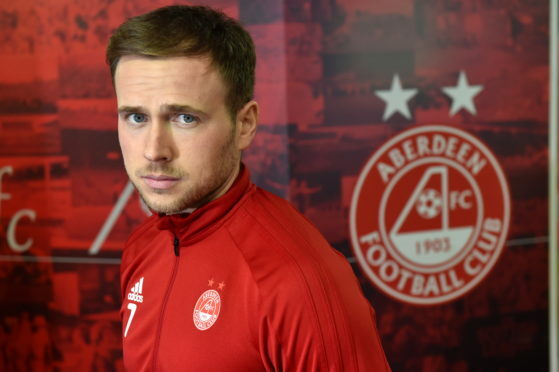 Stewart, on loan at Aberdeen from Birmingham City, is a free agent in the summer and Dons boss McInnes had hoped to do a permanent deal with the player at the end of the season. However, Rangers appear to have jumped to the front of the queue for the former Dundee man, who spent the first half of the campaign on loan at Premiership rivals Kilmarnock. McInnes is attempting to shape his squad for next season, with Graeme Shinnie and Gary Mackay-Steven nearing the end of their contracts and several players due to return to their parent clubs at the end of their loan deals. Stewart is in his second stint at Pittodrie after a loan move last season and McInnes has not been taken aback by interest in the 29-year-old. He said: “I’m not surprised. He’s a free agent but I can’t say which clubs he has spoken to. I want to work with good players and he is a good player. I tried to sign him on a permanent deal in January and if I had any encouragement, I’d try to sign him in the summer. Stewart has shaken off a hip injury to be ready for today’s trip to Dundee, with Dean Campbell the only concern for the Dons after he picked up a foot injury in Wednesday’s 3-1 win over Motherwell. McInnes allowed Scott Wright to join the Dark Blues on loan in January and he has featured regularly in a relegation-threatened side, who dropped to the bottom of the table in midweek. Another loanee benefitting from regular game-time elsewhere is Bruce Anderson, who has contributed four goals in eight games for Championship side Dunfermline. McInnes added: “Bruce Anderson has done well on loan at Dunfermline whereas Scott Wright, on loan at Dundee, is in a different situation with a team fight for their lives and has been part of a lot of their positive results but he has to make sure he continues to be integral for them.